Welcome to Jan and Göran Rygert's website! If you want to see other pages, just click on the lines in the column on the left! JAN works for Dywidag System International in finances. She was born in McKeesport, a suburb of Pittsburgh, PA, and is of Croatian and Slovakian heritage. One of her specialties is the restoration of oriental rugs. Another interest of hers is folk music. 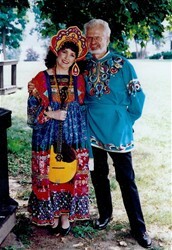 Together with Göran she plays in the Atlanta Balalaika Society, (ABS). Her instrument is the alto domra. She was a member of the Board of Directors of the Balalaika & Domra Association of America, (BDAA). At its conventions she usually leads workshops in Eastern European folk-dancing. GÖRAN is a retired architect, musician and a songbook editor. As an architect he worked 15 years for Skanska in Sweden and thereafter he managed his own architecture firm "Triark" in Lidingö, Sweden. As a musician he is busy with balalaika music as well as choral music. He started playing the kontrabass balalaika in 1978 in the Kazbek Balalaika Orchestra in Stockholm, Sweden, and continued in ABS in 1993. 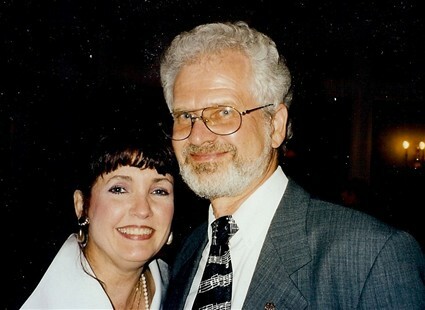 He was a member of the board of directors of the BDAA for 14 years. Göran also is an arranger and composer. In 2007 he won first prize in BDAA's composition contest. He has composed music for orchestras as well as a great number of songs using the lyrics by Swedish poets. Göran founded the Swedish men's choir Vasa Drängar of Atlanta in 1996. Currently they consist of about 10 singers who are very busy in singing at Swedish and Scandinavian events in and around Atlanta. For further information, see page "Vasa Drängar" (in the left column). Recently Göran produced his own CD "Visituder", consisting of his own music with lyrics by some of Sweden's famous poets. For more information, see page "Visituder", in the left column. Since about 1990 Göran has been producing song-books as an editor on a freelance basis for Warner/Chappell Music Scandinavia AB in Stockholm, Sweden, and since 1995 for Notfabriken AB. He has been involved with them on the production of 23 books, and for other music companies additional fifthteen. (according to the Swedish tradition) is to sing first. No schnapps may be sipped before a song has been executed! So, obviously there is a need for schnapps songs, and plenty of them! Göran wrote his first schnapps songs at the Chalmers University of Technology, Göteborg, Sweden. Some of them are still used today. Since then Göran produced several schnapps and drinking song-books. In 2007 the 350 page "Sångboken" came, issued by Chalmersska Ingenjörsföreningen, the alumni association of Chalmers. It is actually the singing history of Chalmers, containing all kinds of songs for all kinds of occasions. Göran is the co-writer with Jan Fäger. Another schnapps song-book is "The Very Best of Sweden's Schnapps Songs", which contains a mix of schnapps songs in English and Swedish. For further information, see page "Snapsvisor", (in the left column). There you can find "The Schnapps Song in English of the Month". music on pages "Balalaika", as well as "Music Groups" on the left. Göran is a member of BDAA, ABS, SHT, SKAP, Visans Vänner and the Öland Club of Stockholm. Both Jan and Göran are members - as well as Board members - of Nordic Lodge #708 of the Vasa Order of America, Atlanta, GA. In 2014 Göran became appointed, by Vasa's Grand Master, "Grand Lodge Deputy" for the district and got reappointed in 2018. "The Very Best of Swedish Schnapps Songs"
please go to page "Köpinfo - To Buy".